"A delicious salad that is great for a quick snack, but attractive enough for entertaining. You can even have it as a meal in a sandwich, or as a salad atop a lettuce leaf." 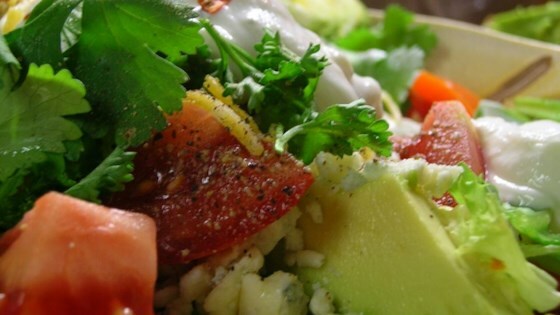 In a medium bowl, combine the avocados, chicken, onion and cilantro. Pour the balsamic vinaigrette over everything, and toss lightly to coat. Easy! I actually skipped the chicken as I didn't have any, but I added some cranberries, walnuts and grapefruit. It was great. This one was different. I can't say I didn't like it, but my husband and I agreed that it wasn't our favorite. I may try this one again b/c I didn't have white balsamic vinegar. I added some tomatoes, feta cheese and topped it with some sour cream ranch dressing and red pepper flakes...add a slice of bread and you have a great meal for a hot summer night. Very good salad! I added sliced grape tomatoes and used this salad as a filling in a wrap - really good and filling! If you made ANY changes to the recipes then don't rate it. A Definite Favorite!! We loved this...as we love avocados...and it was a great mix!